December 12th made for a night of ratherunique music at the Bluebird Theater. Starting things off was Octopus Nebula, hailing from our ownColorado. With an instrumental rockishstyle, they absolutely owned the stage. For those unfamiliar, Octopus Nebula uses the sounds of a guitar, bass,keys and drums to form a style that is a mix of psychedelic and rock. It’s just as interesting as it sounds. 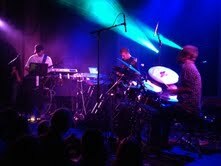 Combined with a quality light show, OctopusNebula was a treat for the ears and the eyes. Next up was Signal Path, hailing from Missoula, Montanabut currently based in Denver. 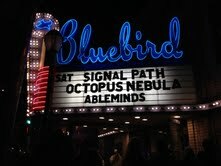 SignalPath is also almost entirely instrumental, with a more electronic sound thanOctopus Nebula. There are a few moreambient elements to the electronic side, but Signal Path also makes great useof drums, guitars and other instruments on top of the electro. It’s certainly fun trying to describe both ofthese bands, since they have such unique sounds. Signal Path was a great hit with the everyoneat the Bluebird, and were happy to oblige with an encore when the entire placebegan yelling for one more song. This was an amazing show for a number of reasons, both bands are very similar and very unique. They havesounds that are not only fun to listen and dance to, but interesting as well. 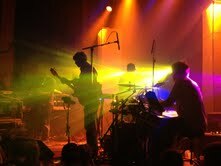 Combine all that with a great light show, andyou have one hell of a show that was totally worth braving the cold for.